How do I download the EOL Manager Software? Log into your account with you username and password. 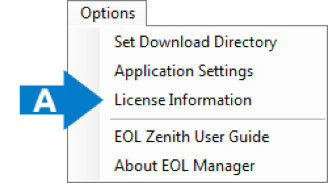 From the download menu within your account you can download the latest version of EOL Manager. When you have downloaded the installation file (EOLManagerSetup.msi) locate the file on your PC and double click it. One single file (EOLManagerSetup.msi) installs both the EOL Manager® and EOL Charting on your pc. The first time you run the software, it will ask for the folder you wish all the data files to be located. That folder will contain all other folders associated with all your future wind measurement sites. We encourage you to keep up to date with the latest EOL Manager version. When you update to a newer version of EOL Manager, please uninstall the “old” version first and then reinstall the new version. No data and/or configuration files are lost during this uninstall and reinstall process. Operating System: EOL Manager is supported on Windows 7, Windows 8 and Windows XP with .NET Framework version 3.5 SP3 or later version installed. MMC card reader: You need a MMC card reader for accessing the data on the MMC card from your PC as well as for configuring the EOL Zenith with your logger settings. Google Earth: If you want to see the exact position of your wind measurement sites, you need to install Google Earth on your PC. Telephone connection or Internet access: If you are planning to connect to the data logger via a telephone MODEM or Internet. We strongly recommend connecting to your data logger via your internet connection. How do I get and/or renew my EOL Manager License. The EOL Manager software needs an active license to run on your computer. You can get and/or renew your software license directly from your online user account. If you do not already have a license, go to “Request Account” and fill out the form. Our support team will then upload your first software license to your user account. Once our support team have uploaded your license you will receive an automatic email notification. When your license is about to expire, just click the “Renew License” button under “Software Licenses” from your user account. What is the easiest way to access my latest wind data? 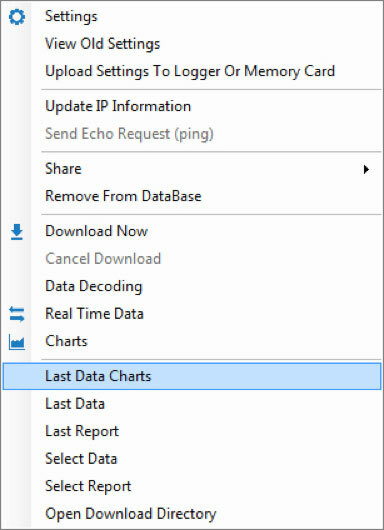 When data is downloaded from your data logger it is automatically stored in the folder you chose when you installed EOL Manager. The easiest way for you to see your latest data is to right click on your data logger in the main dashboard of EOL Manager. You will then see the menu (as shown here below) where you have access to most of the main features to operate an EOL Zenith data logger. Click on “Last Data” (See A) to see your data in table format or click “Last Data Charts” to see your data in EOL Charting. Where should I insert the calibration values from the Measnet calibration certificate? Open EOL Manager and go to the data logger you are working on. Open the “inputs” tab and type in the calibration values from the Measnet calibration certificate. Please notice that it is not necessary to upload these calibration values to the data logger. The data logger simply does not use them. All the calibration values are applied by the EOL Manager once the RAW data (.log file) has been downloaded. When connected in real-time to a data logger, the calibration values from EOL Manager is used. What is the most proper way to organize and move wind data files when working with EOL Manager? Every logger on EOL Manager has its own directory where data is stored. If you want to move the content of the current directory to a new folder, it is very important to do it from EOL Manager and not from Windows. To do so, access to Logger Settings → Site Info tab → Download Directory and type in the User Defined Path field, the path of the new folder you want to move the wind data files to. In case the selected folder does not exist, EOL Manager will create it automatically and then it will automatically move the content from the old directory to the new one. Future data downloaded will be stored in that new path as well. How can I extract the data from an .elog file? The .elog files contain raw data that were sent by email, either by the logger itself or by another EOL Manager forwarding them after download. You can configure EOL Manager to extract the data from the .elog files automatically by selecting “Read Emails From Logger / Synchronize from other EOL Manager” in the “Download” tab of the Logger Settings. In case you need to do it manually, go to Tools –> Import Data Downloaded By Email and then select the files you want to extract the data from. Decoding an .elog file generates three new files: .log (raw data), .txt (report) and .wnd (decoded data). How can I automatically share data with others? There are several ways to share data from the EOL Zenith data logger with e.g. your colleagues, external consultants or your met mast installation company. Click here to download our guide.